CADopia Announces that AutoCAD DWG Compatible Popular CAD Software CADopia 12 is Shipping. CADopia Inc. (http://www.cadopia.com), a leading developer and distributor of CAD software announced today that CADopia 12 software is shipping now with new enhancements and productivity features. 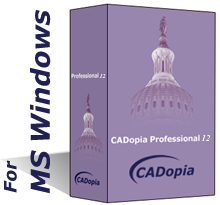 Customers may purchase the software for immediate download and shipment at the CADopia Web Store and at other authorized resellers. CADopia Inc. (http://www.cadopia.com), a leading developer and distributor of CAD software announced today that CADopia 12 software is shipping now with new enhancements and productivity features. Based on extensive feedback collected from current CADopia users, this update incorporates new functionality and enhancements that will help engineers, architects, designers, and drafters create, edit, and view technical drawings with even greater speed, flexibility, precision, and efficiency. CADopia 12 is a full featured CAD solution that provides industry standard .DWG file format support enabling users to seamlessly navigate between different CAD environments. CADopia enables engineers, architects, designers and drafters to optimize their work flow with greater speed and efficiency. CADopia offers an intuitive user interface with industry standard command bars, aliases, menus and toolbars. CADopia also provides excellent compatibility with the Autodesk AutoCAD DWG environment enabling users to work with .DWG files without retraining. 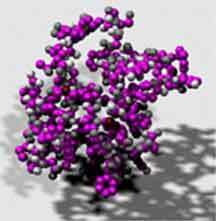 Advanced editing of 3D surfaces for creating sophisticated 3D designs efficiently (Professional Edition only). To learn more about the new and existing features in CADopia software, please visit: http://www.cadopia.com/about_us/news/cadopia12.asp. 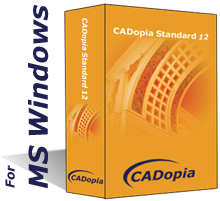 CADopia 12 is available in 2 editions – Standard and Professional. A floating network license option with terminal server support is available for enterprise users for both the Standard and the Professional editions. A 30-day evaluation copy of CADopia 12 software may be downloaded at http://www.cadopia.com. 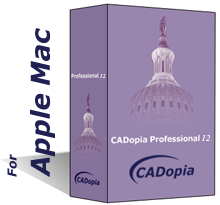 CADopia 12 is available for both Microsoft Windows (XP, Vista, 7) and Apple Mac(R) OS platforms. “I had no trouble transferring the surveyor’s drawings into CADopia and adding to the original plan.”, said Rob Wallace, Property Manager at Arrowfield Group Pty Ltd, a championship stallion breeder based in Australia. "I have found it easy to use and invaluable in helping me do my job more efficiently, thank you for such a great program." Based on Graebert technology, CADopia 12 is available in 12 languages (Chinese, Czech, English, French, German, Italian, Japanese, Korean, Polish, Portuguese, Russian, and Spanish). CADopia Professional and CADopia Standard are available for purchase for $649 and $399 respectively. Registered users of other CAD software and older versions of CADopia are eligible for discounted upgrade pricing. Accredited educational institutions may purchase full featured Lab paks at substantial discounts. Students and teachers may also purchase full featured Professional edition for non-commercial use at educational discounts. Reseller inquiries are welcome. For additional details, please contact sales@cadopia.com . For media resources including evaluation guide and digital images, please visit http://www.cadopia.com/mediaresources/ . CADopia and the CADopia logo are the trademarks of CADopia Inc. All other trademarks, trade names, or company names referenced herein are used for identification purposes only and are the property of their respective owners. CADopia (http://www.cadopia.com) is creating the industry standard for an affordable and powerful CAD solution. With a user base spanning over 80 countries across the globe, CADopia is one of the world's most popular providers of professional CAD software. Founded in 1999 in San Diego, CADopia is a privately held California Corporation. For more details, please visit CADopia’s web site at http://www.cadopia.com.